The Copernicus Sentinel-2B satellite captured this true-colour image on 5 February 2019, just three days after heavy rainfall in Rome and the surrounding area of Lazio, Italy. It shows sediment gushing into the Tyrrhenian Sea, part of the Mediterranean Sea. The downpour on 2 February led to flooded streets, the closing of the banks of the Tiber River and several roads. The Tiber River can be seen snaking its way southwards in the image. The third longest river in Italy, it rises in the Apennine Mountains and flows around 400 km before flowing through the city of Rome and draining into the sea near the town of Ostia. The Tiber River plays an important role in sediment transport, so coastal waters here are often discoloured. 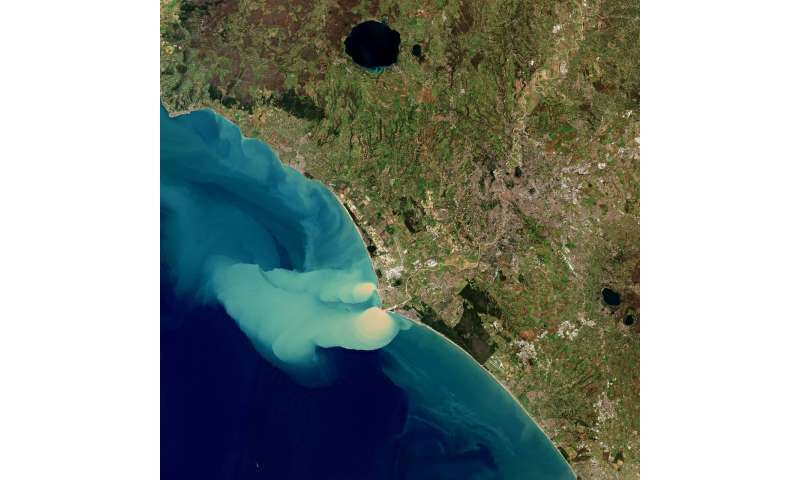 However, the recent rains resulted in a large amount of sediment pouring into the Tyrrhenian Sea, as this image shows. The sediment plume can be seen stretching 28 km from the coast, carried northwest by currents. Copernicus Sentinel-2 is a two-satellite mission. Each satellite carries a high-resolution multispectral imager to monitor changes in vegetation. It also provides information on pollution in lakes and coastal waters.